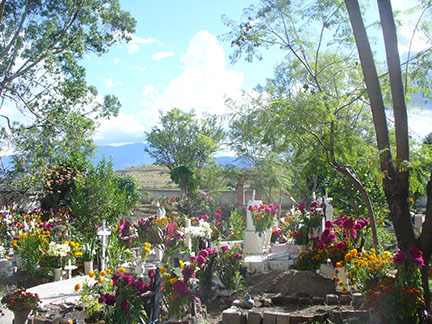 For 24 hours on November 1, the cemetery of Teotitlán del Valle was empty — the departed had a 24-hour pass to visit their homes and families. At least that’s the belief of the people there, celebrating a long tradition of the indigenous Día de los Muertos (Day of the Dead) that was handily moved onto All Saints Day by those Spanish conquistadors who wanted things more neatly packaged on their own holiday schedule. Katie and I were guiding one of seven special tours sponsored by En Vía, the women’s microfinance organization that I’ve been volunteering with for five years. 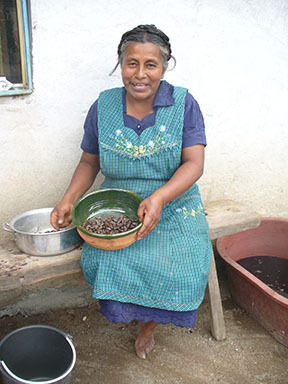 Proceeds from the English-speaking participants go into the loan pot; this was a special tour to understand more of one family’s celebration of this most important of Mexican holidays. It’s a little bit of Christmas, homecoming, Halloween and Mardi Gras rolled into a celebration that doesn’t celebrate death, but is a time for remembering the lives and memories of our departed friends and family. 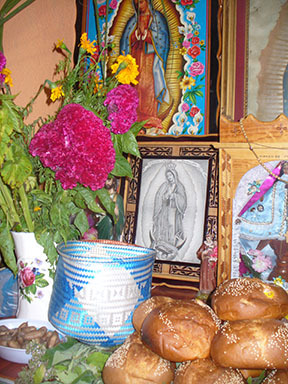 It’s the time of year when most Mexicans come home, because home is where the spirits of the departed (los defuntos) are going to land when they get their pass from the panteón. 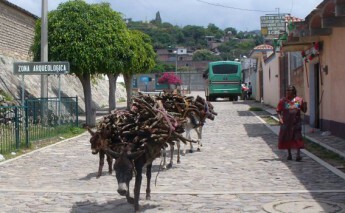 Our group of 11 participants, from the U.S. and Australia, travelled the 30 minutes or so to Teotitlán del Valle by van to the home of Isabel Martinez Mendoza, a young weaver in her 20s who lives in the family compound of her parents, brothers and sisters, and a cousin (the property is divided neatly in half by an “invisible line,” confided Isabel, though they all know where it is). 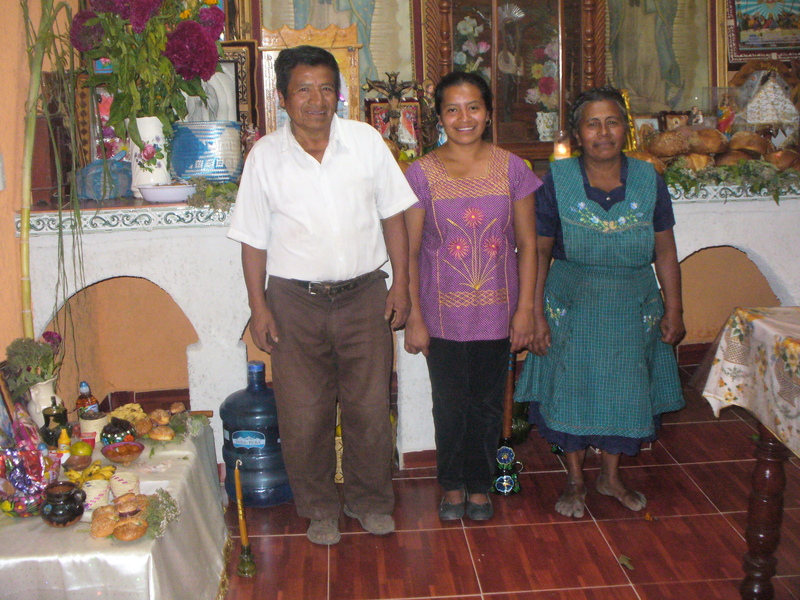 Isabel, her mom and dad shared the family traditions behind their ofrenda, the special offering on the altar that is always part of the living room – which features a saint behind glass that her great-great grandparents brought here more than 100 years ago. There are traditional elements for Day of the Dead: candles to light the way from the afterworld back to this one, food (peanuts, egg bread and little apples) because it’s been a long trip and they’ll be hungry, and especially their favorite drinks – usually mezcal – because of course they’ll want to celebrate being home with the family again. And the family will want to celebrate their return as well. We wrapped up at Isabel’s with a meal of tamales in yellow chicken mole, followed by a demonstration of chocolate making by Isabel’s mom, made into hot chocolate and served with pan de muertos, an egg-yolk-based sweet bread. 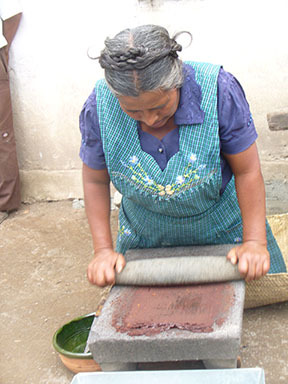 The family made quite a few rug sales as well, a boon to the presentation of their business and explanation of how they use their En Via loan money. The group left me on the side of the main street of Teotitlan with the three bags I’d been carrying all day: my guide materials and notes, a backpack with toothbrush and change of clothes, and the food (homemade hummus and cut-up vegetables) I’d be taking at the party I was going to next. I grabbed a mototaxi up to the house of my friend Michelle V., who was hosting a dinner party for a group of 30 tour participants from Indiana, also honoring several of us (including her brother Nick) who had had big birthdays this year. It was 60’s dress optional, but I’d packed a tie-dye T-shirt and head scarf, and most of the group was also in fringe and tie dye. The food was great, there was live music and dancing on the outside terrace, and in general a fine time was had by all. Then it was on to the house of friends Siobhan and Spence, who I’d pre-arranged to spend the night with rather than brave the nighttime highway back to Oaxaca. I can only say that an uninterrupted 9 hours of sleep was worth every minute of the logistics it took to get there. José showed up promptly at 7:30 the next morning, unexpectedly on the motorcycle; I was a little put out since I was toting a fair amount of bags. And though he remembered to bring my good tennis shoes for hiking and an extra jacket in case it was windy, unfortunately he forgot the most important thing: a second helmet. We went on and hiked with Siobhan and her two dogs up into the foothills over Lachigoló, ending up at the newly purchased piece of property that an American/Canadian couple intend to develop as an RV campground. On their first day, the weird electric water heater for the shower had been on as the same time as the washing machine, and the single fusebox had blown, leaving them with no electricity. They did have good view and a heck of a property, complete with old wagon and industrial-sized carport which had housed earth-moving equipment for the previous owner. Fortunately, Siobhan’s husband Spence has a motorcycle and helmet, and he agreed to loan us the helmet which I’d return the next day to the English library so that Siobhan could get it there. We managed to stuff the cooler bag into my backpack, and the highway trip back on the old Tule road was mercifully uneventful on the Bruja, Jose’s Honda 450 Rebel, whose American name is Black Magic Woman (painted on the back). Monday evening, Nov. 2, we headed to the Panteón General, Oaxaca’s main cemetery, when many do grave vigils and cemetery-side parties all night. 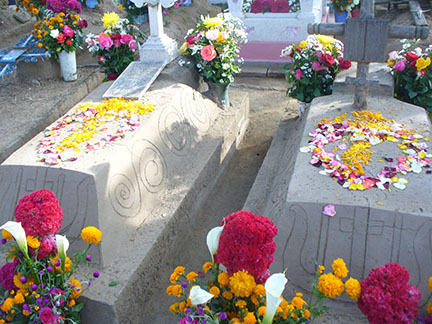 The flower sellers set up camp right outside the cemetery walls, taking advantage of the fact that people will decorate their loved ones’ graves; the taco, tamale and other food sellers the same – you’re gonna be hungry sometime doing all that grave sitting. There’s even a carnival right outside the cemetery gate, with rides and junk food and carny booths. We lay yellow marigolds (sempazutchil in Zapotec; they don’t even use the Spanish word) and scarlet cockscomb (the same name, cresta de gallo) on the grave of Jose’s father, who passed away a couple of years ago and by lack of money and agreement among the grown kids, still has only a dirt mound and small iron cross to mark his life of 82 years. 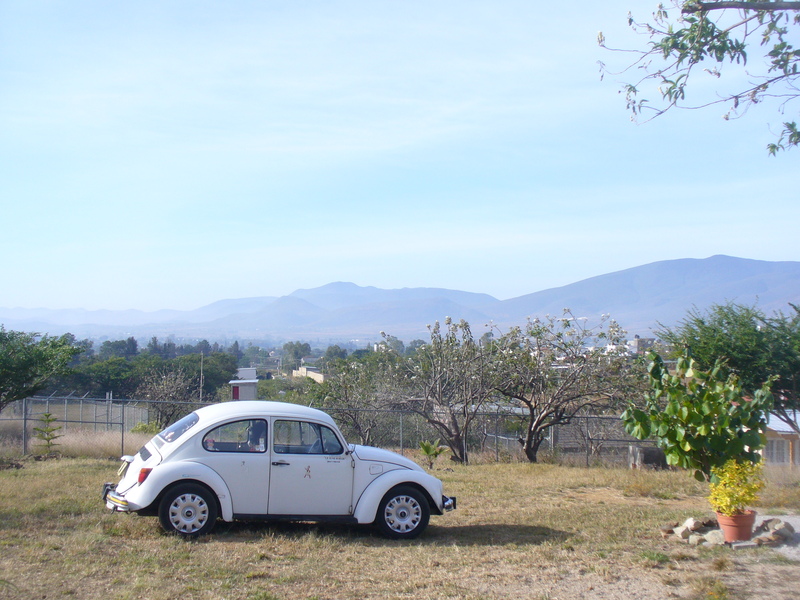 Then we headed over to the party my friend Jane throws annually at the grave of her husband, Thorny, who died several years ago in a car accident heading back to the bed and breakfast they owned in Oaxaca – which she still runs. 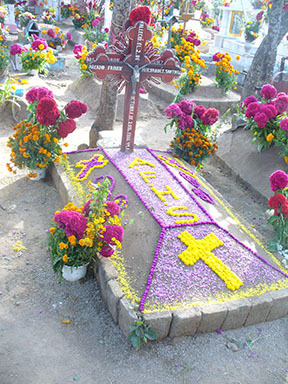 It’s a blowout affair every year though I’d never been – all invited to decorate Thorny’s grave with flowers and candles (so many, we had to decorate his cemetery neighbor’s grave too), folding chairs, tamales and beer, and a full mariachi band. We left around 9 with the cemetery in full swing, the carnival lights flashing outside as the band played on. 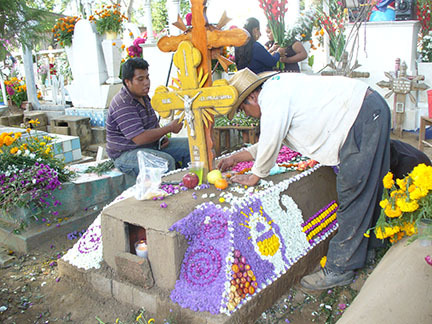 The next day, Tuesday November 3, my friend Michelle M. – an English teacher at Oaxaca’s Berlitz School and I headed out to San Antonino to check out their cemetery and their annual grave decorating contest. We’d had the opportunity to join several different group tours, but figured that we could wing it on our own. We took an urbano from our barrio to the giant Abastos market, where we wandered around a little before finding the right colectivo to take the 45-minute trip to San Antonino. We snagged the back seat instead of the front where two people have to sit in each other’s laps, but I still (as seems to happen frequently) got the seat next to an extremely stout indigenous lady with a huge bag on her lap. Who slept and snored the whole trip too. 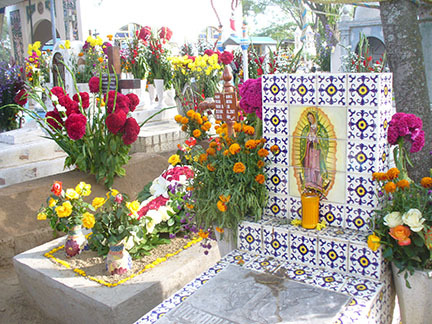 The San Antonino grave decorating contest is with all fresh flowers, like a Rose Bowl parade float. Families come into the cemetery in the afternoon and mound up damp sand into the shape of a casket (is there a mold? Or just a trowel? ), sort of like a sand castle. They sketch designs into the sand with a nail, and then painstakingly stick in flowers and petals of all varieties and colors into elaborate designs. 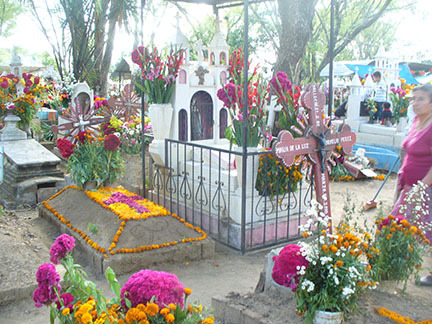 Crosses, virgins, swirls, flowers, geometric designs, the deceased’s name and dates – all for a day’s viewing and contest. I have to say, it was spectacular. But the three-day gala of events had to end, and I admit that even without all-night costume parties (which I had done in the past, see A Day of the Dead to Die For) it was still a full dance card. I’ll be back to Teotitlán for sure for the holiday next year (or as Mexicans say, dios mediante, God willing, not to jinx the universe or presume that I actually have any control over the future). I just won’t be at the cemetery from 3 p.m on November 1 to 3 p.m on November 2. There won’t be anybody home.